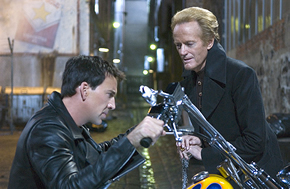 Publicity Stills of "Ghost Rider"
A motorcycle stuntman named Johnny Blaze sells his soul to a dark force to save the life of his father. When the pact goes awry, Blaze becomes a fiery demon like entity who takes out his wrath on bad guys. Joining the ranks of Marvel’s comic book movie franchise along with the likes of X-Men, Spiderman and Fantasic Four, Ghost Rider blazes into our cinemas this week with the explicit intent of wowing the audiences with a dark adventure thriller packed with an engaging storyline, fast-paced action scenes, excellent cast and great CGI. 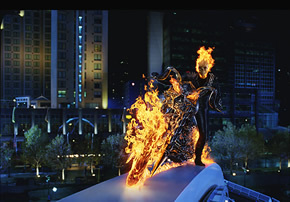 Writer and director of 2003’s Daredevil, Mark Steven Johnson returns to Marvel universe to do the same for Ghost Rider. Tweaking some of the original facts, Johnson manages to keep the movie version fairly true to the comic book. The script ensures that the plot keeps up a good pace with the right mix of humour and sinister moments, with fiery action sequences to keep the edge on. He also makes sure to place in several key character-driven scenes to give the characters enough depth to get the audiences rooting for them. 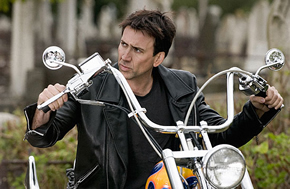 Versatile Academy Award-winning actor Nicholas Cage takes on the lead role of Johnny Blaze/Ghost Rider, and boy, he does not disappoint. Sporting a well-toned physique that will get the ladies gawking, he also sports the perfect attitude and charm well fitted for the character. Watching him transform from man to skull blazing bounty hunter is a rush on its own as Cage morphs from an expression of intense pain with skin peeling and burning to that of maniacal pleasure in the form of a fiery cranium. The other cast worth mentioning is Eva Mendes, who plays teenage sweetheart Roxanne Simpson, is a pleasure to watch on screen with her beauty and feisty disposition. And Wes Bentley, best known for his role in American Beauty, portrays the villainous Blackheart with an appropriate amount of vile and viciousness that does not go overboard. When special effects are applied correctly with a good cast and script, the result of excellent story telling illustrates itself, and that is what took place with this movie. The CGI and special effects were brilliant and audiences will be glad to know that not everything was CGI. The cinematography was breathtaking and surprisingly good for a comic action adventure thriller. 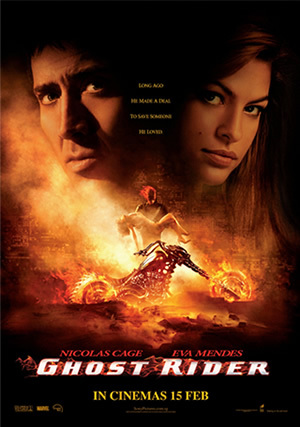 The only shortcoming of this film is the lack of screen time for audiences to have the benefit of watching more of Johnny Blaze and the legend of the Ghost Rider. Also, with the amount of dark stuff going on, it might not be such a good idea to bring kids below 13 to watch this. At the end of it all, far from being a cheesy and clichéd comic book action movie, the Ghost Rider proves itself to be one hell of a thrill ride, certainly worth the journey. Audiences can only hope that a sequel will be soon in the works and the Ghost Rider will be back on his hell wheels to give us more.